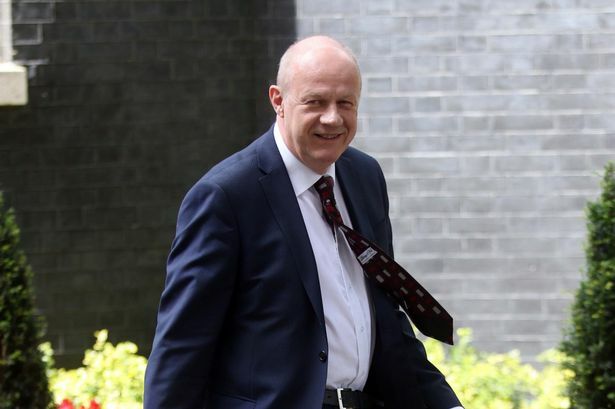 Damian Green: He won’t have read the comments in this article; worse, he clearly doesn’t care [Image: Daily Mirror]. The author of this article drew my attention to it, and now I’m asking you to read it too. This is just a fraction of the whole, and I recommend you visit the Muscular Dystrophy UK site for the full piece. The government claims as a disabled person, you have rights to protect you from discrimination. It cites the Equality Act 2010 (please refer to here https://www.gov.uk/guidance/equality-act-2010-guidance) & the UNCRPD (please refer to here http://www.un.org/disabilities/convention/conventionfull.shtml) will help to enforce, protect & promote your rights. So, it is surprising to find last week that the UK, as a result of being the first member to be investigated by a United Nations committee for not fulfilling the terms of the UNCRPD, have been found guilty of grave & systematic violations of the rights of disabled people as a direct result of austerity policies introduced into welfare & social care by the UK government aimed at reducing public spending since 2010, an inquiry has concluded. The highly critical report (please refer to here http://tbinternet.ohchr.org/_layouts/treatybodyexternal/Download.aspx?symbolno=CRPD%2fC%2f15%2fR.2%2fRev.1&Lang=en), published in Geneva on Monday 7th November 2016, says a range of measures including controversial cuts to disability benefits, social care budgets & the introduction of the bedroom tax, have disproportionately & adversely affected the rights of disabled people to live independently, to work & achieve an adequate standard of living. It makes 11 recommendations, including calling on the UK government to carry out a study of the cumulative impact of all spending cuts on disabled people & to ensure the human rights of disabled people are upheld. In response, the government stated it “did not plan to follow up on any of the recommendations”. Isn’t this to our nation’s shame? Why hasn’t there been public outcry? Why has it not been plastered across our television screens constantly? Why haven’t hordes of disgruntled & angry citizens waving placards not taken to the streets en masse in protest at the treatment of one of the proudest but, flawed sections of society? Because it’s been another stroke of luck for the government that in the same week this damning report was published, the Americans voted for a misogynist, racist to be their president & Mondelez International changed the size of bloody Toblerone! I am shocked & saddened at the apathetic reaction to this report by the public. This is your money, not the government’s, despite what they might think. It’s your money that you work damn hard for that is purposely being withheld or wasted by the very government department, the Department of Work & Pensions (DWP), charged with protecting the less fortunate. Then there is the derision emanating from the new Secretary of State for Work & Pensions, the Rt Hon Damian Green MP. [His] reaction is reminiscent of a scolded child. It is vulgar & quite frankly, damn right offensive. [His] protests are based on a misplaced, perceived sense of injustice for which [he has]no justifiable right to be offended. I find Mr Green’s response is in keeping with the condescending & disrespectful attitude to the disabled which lies beneath the policies borne of his department. Mr Green, if you think people losing their cars, their jobs, their homes, unprecedented reliance on foodbanks, destitution & even people taking or losing their lives are indicative of successfully supporting disabled people & an efficient way of distributing £50 billion then we have very contrasting definition of success. And exactly how much of this alleged £50 billion outlay does the DWP waste on maintaining an IT infrastructure that’s not fit for purpose? And I would be very interested to know exactly how much of this alleged £50 billion the DWP spend, is spent by them defending & enforcing their draconian measures (such as the bedroom tax) in court via First Tier Tribunals, Upper Tribunals & beyond. Mr Green is trying to defend the indefensible in government policy & the DWP. The motivation for the change in welfare is to drive down costs. The reality is; the skivers & malingerers you’ve portrayed us as, the disabled, has turned out to be the genuinely sick & ill & now we’re suffering as a direct result. Money. It’s all about money for the Tories … & always has been. Austerity is about money & clearly [the Conservative] government value money more than life. You are guilty of systematic violations of our human rights sir. Fact. Surely this is the nation’s shame? People don’t care, it’s the I’m alright Jack, attitude of the majority, of course until they find themselves victims of these policies. Those same people will smug themselves in the belief they can always cosset in private provision with their peasant derived wealth. Take away their wealth and their smug arrogant attitudes would fall like Autumn leaves as they too become victims of their own greed. But how would this ever happen in this globalized world where the next cash cow is queuing down a fibre-optic snake. It is arrogance that dictates their victims and guides them to exploit the weakest in society, but if you believe it will stop at the sick and disabled, think again. The very avarice that is practiced is part of a larger philosophy, one that will continue to drive Tory politics to ever more extreme acts to realize greater gains from the next weakest target. This is a natural progression of capitalism, a consequence of greed, acceptable only to the winners. The flaw however lies in the very chain of events capitalism relies on, the production of wealth from the masses of their victims, the servitude of the many, the relentless reduction in costs. Cut this chain and Autumn begins. Mass withdrawal of labour seems the only expedient action, lobbying is ignored, the will of the masses dismissed, protests bullied into submission, criticism culled. Perhaps it’s time for these victims and sympathizers to unite, for many, things can get no worse and they have nothing to lose. As we approach this undeniable tipping point the masters at arms should be afraid, very afraid. It is shameful and against every human right . Mr Green , I do not like to calll people hateful liars, however you and I and many millions more know this to be true. You are unfit to be in any form of government as are your colleagues. You have tortured and killed the sick and disabled poor. Making their last days on this earth unbearable. If there is such a place as hell you and your likes have just booked your eternity there..
You can’t communicate with him via this site, you know! Comment about him rather than to him. I suspect a lack of worrying about an eternity spent in Hell, is what might make Damien Green worse than Ian Duncan-Smith. Though were are in the deluded or deceitful paradigm, once again. I tend to suspect the former with I.D.S. and later with Minister Green. I don’t. Duncan Smith didn’t care about his eternal soul (if he has one) and neither does Green. How much of that £50 billion actually has anything to do with benefits for the disabled? That’s the operative question here. Muscular Dystrophy UK, well done, a cogent, accurate and moving statement of Conservative government policy towards the disabled (and for that matter, the children of the poor and disabled, not too mention the average earner and those who will become disabled, and who think they are paying National Insurance contributions to cover that eventuality). This is excellent, but should never have had to be written in the first place. All disabled people, and I mean all [and/or their carers], need to begin seriously challenging this government at every opportunity. It may be difficult for many, but it is becoming more and more necessary to stand up to the contemptuous and arrogant people who see ‘us’ as a burden… before it really is too late. Having just read the full article, I recommend everyone else to follow suit, and if possible, read the report[s] linked to within. Once that’s done, please pass the message on as widely as possible.. It does make me seriously wonder how much higher the death count is going to get. How many more people are going to commit suicide or die because of the government? I would never have counted on Mr Green, he is just another Tory that is under the thumb of May to say the right thing. If no criminal prosecutions result from all of this, no disrespect, but that will be the REAL TRAVESTY! What’s the point of having the UN produce a report, if it’s just a case of no further action? I have just come in from seeing the film I Daniel Blake, a must see film that can only tell half of what it must be like for so many. I warn you not to grow old. Modern Conservatives know no shame. The disabled can look down on them from their sick beds and wheelchairs. My experience is that discrimination legislation is being ignored or abused by employers. I qualified as a social worker in July 2015 and still can’t get a job. I walk with a stick. I even had one manager tell me that I couldn’t work in their team because service users would take my stick and use it as a weapon. However ‘officially’ I was not offered a job because I didn’t have enough experience. So I couldn’t challenge it on discrimination grounds. However I have worked in social care since 1986. Students who I studied with with as little as 6 months experience, have all got jobs; all able bodied of course. I have had MANY experiences where my disability has been an issue in stopping me getting employment. And that is within a profession which is supposed to have principles and commitments towards anti discriminatory and anti oppressive practices. It left me having to apply for ESA after becoming qualified. I’ve seen IDS in the HoC recently about the ESA cuts, and I believe that half of what he comes out with now, he is just saying, because he’s potentially concerned about the criminal investigation going on against him.